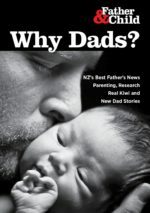 Posts tagged with "Parenting Services"
A Fatherhood Forum held on 1 May in Invercargill drew more than 60 attendees from non-profit and governmental agencies. The event was organised by the Families Commission and hosted by Our Way Southland, a collaboration of the four Southland-based Councils. Recent research shows that dads need to be more included in family services says Families Commissioner Gregory Fortuin. A new study by Nelson researchers David Mitchell and Philip Chapman on experiences of separated non-resident fathers found that research participants were either unaware of existing services or considered them unfriendly towards men.